IMAX® documentary recognized for its ability to inspire and entertain audiences. Presented in awe-inspiring IMAX® and IMAX® 3D, “A Beautiful Planet,” narrated by Academy Award® Winner, Jennifer Lawrence, has been honored with the Truly Moving Picture Award from nonprofit arts organization Heartland Film. Select theatrically-released titles — entertaining films that do more than just entertain — receive the designation throughout the year. Submissions are received directly from studios and producers for consideration. “A Beautiful Planet” is a breathtaking portrait of Earth from space, providing a unique perspective and increased understanding of our planet and galaxy as never seen before. Made in cooperation with the National Aeronautics and Space Administration (NASA), the film features stunning footage of our magnificent blue planet — and the effects humanity has had on it over time — captured by the astronauts aboard the International Space Station (ISS). From space, Earth blazes at night with the electric intensity of human expansion — a direct visualization of our changing world. But it is within our power to protect the planet. As we continue to explore and gain knowledge of our galaxy, we also develop a deeper connection to the place we all call home. From IMAX® Entertainment and Toni Myers — the acclaimed filmmaker behind celebrated IMAX® documentaries “Blue Planet”, “Hubble 3D”, and “Space Station 3D” — “A Beautiful Planet” presents an awe-inspiring glimpse of Earth and a hopeful look into the future of humanity. Exclusive IMAX® and IMAX® 3D engagements of “A Beautiful Planet” are now playing across the country. Heartland Film is a nonprofit arts organization founded in 1991 with the mission to inspire filmmakers and audiences through the transformative power of film. 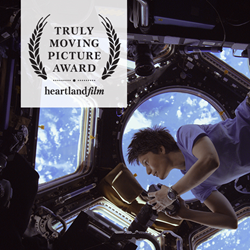 Heartland Film is a curator and supporter of purposeful filmmaking, honoring a wide variety of cinema and awarding storytellers from all over the world. The films Heartland Film selects and exhibits – whether they inspire and uplift, educate and inform, or have the ability to shift audiences’ perspectives on the world – all have one thing in common: they are entertaining films that do more than just entertain. Every October, the Heartland Film Festival gives its moviegoers access to more than 100 visiting independent filmmakers from all over the world, right in the heart of the Midwest. Heartland Film Festival (Oct. 20-30, 2016) showcases more than 130 independent films over 11 days of red carpet premieres and events, parties and hundreds of film screenings across Indianapolis. The Heartland Film Festival has earned the special designation of being a qualifying festival for the Annual Academy Awards® within the Short Films category. Each year, the Heartland Film Festival awards more than $125,000 in cash prizes and presents its Festival Awards to top-judged submissions. Heartland Film has awarded more than $3 million to support indie filmmakers over the last 24 years. Beyond the Heartland Film Festival, Heartland Film honors theatrically-released films that align with its mission via the Truly Moving Picture Award, inspires the next generation of filmmakers via the Heartland Film Institute, and exhibits films across Indiana all year long via the Heartland Film Roadshow. To learn more, visit heartlandfilm.org.